SCOR participated in a trial organized by the Chief Risk Officer Forum to design a common taxonomy that could be used to capture digital events. Digitalization remains at the epicentre of companies that seek to adapt to new risks and to implement resilient systems. The insurance industry in particular needs to closely monitor developments so as to maintain proper risk management controls and develop appropriate responses. The primary difficulty in providing a credible view of digital events is the lack of common terminologies within and across organizations. For instance certain terminologies (STIX, VERIS, TAXII) are not widely used nor specific enough for insurance. The CRO Forum proposed, via an organized trial, the use of a common language that enables specialists to communicate across industries and institutions. The trial participants – the member organizations of the CRO Forum, including SCOR – captured and shared nearly 700 medium- or high-impact digital events over the trial period. 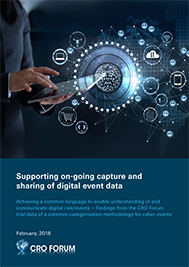 The CRO Forum’s subsequent paper “Supporting on-going capture and sharing of digital event data” explores the roadblocks to developing common language for digital event data, how the taxonomy evolved and how it can develop even further. The CRO Forum is a group of professional risk managers from the (re)insurance industry that focuses on developing and promoting industry best practices in risk management. Made up of Chief Risk Officers from large multinational insurance and reinsurance companies, including SCOR, it aims to represent the members' views on key risk management topics, including emerging risks. Since 2016, SCOR has been the leader of the Emerging Risk Initiative work group.